A group of paddlers who also taught at Queen’s University Faculty of Education were sitting around chatting about their various recent summer trips when the idea was hatched to have a conference which would explore aspects of the canoe in Canadian culture. And so was born the Canexus Conference, which happened in the fall of 1988. Some of the papers that were delivered at that conference were published in this book, which came out a year or so later, tastefully illustrated with evocative pencil sketches by Bill Mason. 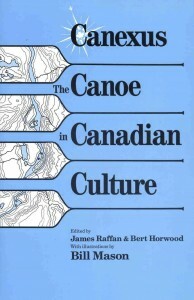 From “Canoe Sport” to “Canoe Irony” and finding “Motives for Mr. Canoehead,”Canexusopens doors to the primitive and explores the canoeing experience from an exciting variety of perspectives. Travel with some of Canada’s best known canoeists to the mysterious Northwest Coast of BC, across constitutional waves on Meech Lake and into a landscape of the Canadian imagination. Hear great canoe stories, bake bannock, weather storms, ponder canoeing and gender roles. For all kinds of paddlers, and lovers of adventure and wilderness, Canexusgives the canoe its rightful place of prominence in Canadian culture. With contributions by E.Y. Arima, Philip Chester, C.E.S. Franks, Shelagh Grant, Bob Henderson, Bruce Hodgins, Gwyneth Hoyle, William C. James, C. Fred Johnston, George Luste, Roderick A. Macdonald, Kenneth G. Roberts and Kirk Wipper.